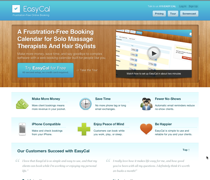 EasyCal lets solo service providers take online bookings for their business. You set up your services, locations, and availability, and you get a unique web address and booking calendar for your business. Your customers can book appointments for the services you offer using that booking calendar. You save time, make more money, and relax knowing that your clients can book an appointment with you any time. All other online calendars are built for large organizations – EasyCal’s the only service that’s built for soloists (people who only book appointments for themselves). Because we’re only focusing on scheduling you (instead of you plus 5-10 others), we made our calendar the simplest one around.